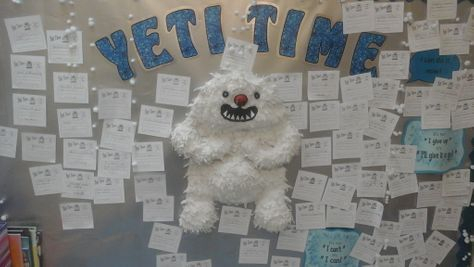 If you have a child in Year 2 you may be wondering who Yeti is and how he helps with our learning! Yeti is Eric's best friend and is there to encourage the children to keep trying hard and choose things that are difficult rather than taking the easy option! say "I can't do it YET!" Yeti is our way of encouraging the children to develop more resilience and responsibility for their learning. Twice a week Year 2 have 15 minutes with their Yeti Pack and this is the time THEY choose which skills they need to work more on. This might be spelling, handwriting, Buzz Words, learning times tables, joining their writing, in fact anything that they have been learning that they think they need to improve.